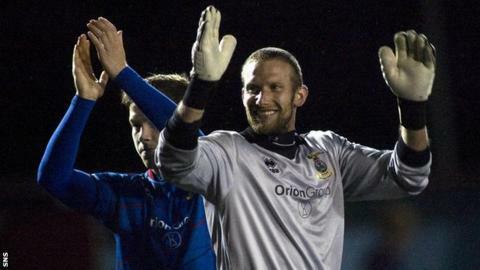 Inverness made the Scottish Communities League Cup quarter-finals after overcoming Stenhousemuir on penalties. The visitors took the lead when Billy McKay headed Richie Foran's pass home. Stenhousemuir levelled after Brown Ferguson was fouled in the box and he converted the penalty himself. Neither side could find a winner in regulation or extra time and penalties ensued, with Ryan Esson saving Darren Smith's spot-kick to send the Highlanders through. Inverness join Celtic, Dundee United, Hearts, St Johnstone and St Mirren in the last eight, with two more ties to be played on Wednesday. The driving wind and rain made for difficult conditions and John Gemmell's early shot for the hosts did not find its target. Goalkeeper Robbie Thomson, making his first appearance since joining Stenny on loan from Celtic, gathered Aaron Doran's fizzing shot at the second attempt shortly before the visitors moved ahead. McKay raced onto Foran's clever pass and lifted the ball over Thomson. Doran again tested Thomson and the save proved crucial with Stenhousemuir soon levelling. David Raven felled Ferguson inside the area and the forward held his nerve to leave Esson with no chance. And the home side, who eliminated last season's tournament winners Kilmarnock in round two, almost had the lead before half-time, Stewart Kean's attempt bouncing off the top of the crossbar. Further stops by Thomson denied Foran and Raven and Kean came very close to sealing a winner in the closing stages of regulation time, his effort just missing the post. Andrew Shinnie and Smith had efforts saved during a tense extra-time. Inverness captain Foran struck the first penalty in the shoot-out against the post but, after Ferguson, Graeme Shinnie, Andy Rodgers and Gavin Morrison converted in succession, Stenny's Bryan Hodge fired his spot-kick off target. Aaron Doran and John McMillan and then Andrew Shinnie and Ross McMillan were also successful, meaning the shoot-out went to sudden death. Ross Draper put Inverness ahead but Kean levelled and then Philip Roberts put the visitors in front. Smith stepped up needing to score to keep the Second Division side in the competition but Esson saved to book Terry Butcher's side a place in the fourth round. Stenhousemuir manager Martyn Corrigan: "It's disappointing to lose on penalties but I can't fault the lads for their effort. "We had a great chance at the end of the 90 minutes but couldn't quite take it. "The lads are disappointed but can take a lot away from their display tonight." Inverness manager Terry Butcher: "It certainly wasn't comfortable and we are really pleased to be through. "I said before it wouldn't be 0-0 and Stenhousemuir made it very difficult for us. "Both sides deserve great credit for trying to play football in such difficult conditions and we are delighted that, at the end, we've made it through."